Earlier this week the national tax agency announced that, on average, land values throughout Japan went down 1.8 percent, raising hopes in financial circles since it’s the lowest drop in a long time. Any sign that the economy is improving is given a lot of play in the media, though a closer reading of the statistics indicates it may not be what it seems. As almost all the stories point out, the main brake on the drop in property values was the sudden surge in sales of luxury condos in the major cities. If you discount those sales, much of which is being spurred by overseas investors, the drop in value is pretty much the same as it’s been for the past decade or so. In Asahi Shimbun’s coverage, a reporter talked to a 37-year-old salaried worker who was looking to buy a used condominium in Ichikawa, Chiba Prefecture. He found one that was very cheap and only 10 minutes from Motoyawara Station, but was disappointed by the “undeveloped” quality of the neighborhood. A local realtor told the reporter that his business has not changed at all. Property values in the area are 4.7 percent less than they were a year ago, when the values were 4.4 percent less than they were in 2011. “The only place that’s any good is the center of Tokyo,” he said. 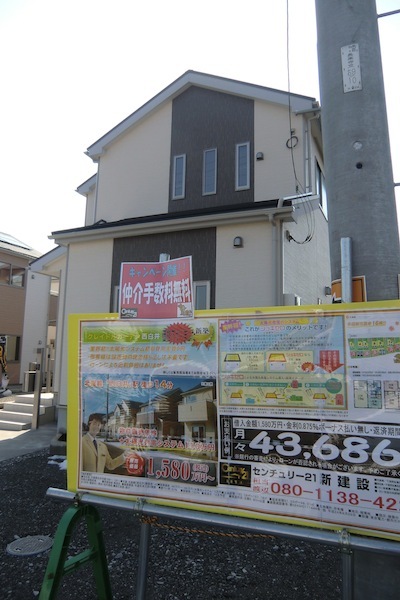 Another realtor in Kofu, Yamanashi Prefecture, told the paper that the value of properties near the main train station declined 3.8 percent over the previous year, and he didn’t sound hopeful, citing the fact that there has been no increase in the last year of “inquiries for home remodelings” that actually lead to contracts for work. “That’s because nobody’s income has increased.” The media was expecting a rush on home sales prior to the increase in the consumption tax next April, and until May, housing starts rose year-on-year for nine months straight. That statistic may go south, however, since there is a suspicion that interest rates will also go up in line with the government’s monetary easing policy, thus discouraging some potential new homeowners. Almost everyone Asahi talked to, from realtors to securities analysts, believe that the situation won’t change significantly unless average people start making more money.